California's Eastern Sierra is incredibly rich in photographic opportunities. We'll show you the best of them. Highway 395 in the remote Eastern Sierra provides access to some of the most interesting and photogenic places in California. Come explore with Lance and Tim. This was a 5-night, 6-day workshop. The adventure began at noon on October 30 and ended at 3 p.m. after the group slideshow on November 4. There was an optional farewell supper after the slideshow. This workshop occurs just before the full moon, and is intended intended primarily for photographers who are interested in light painting by moonlight. 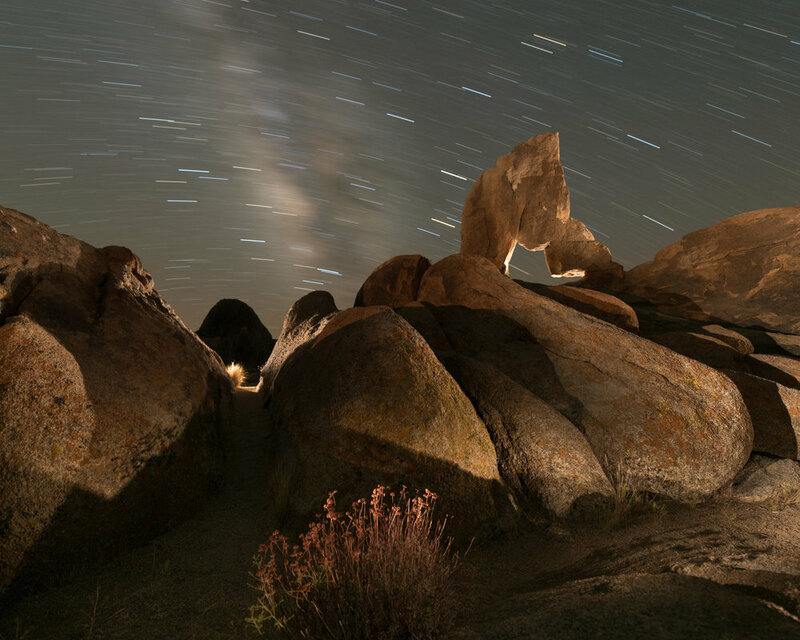 The workshop will feature three nights at the Alabama Hills in California’s Eastern Sierra, one night at the Ancient Bristlecone Pine Forest in the White Mountains, and one night photographing in a special mystery spot. Participants must have at least basic photo skills, know their cameras well, and be comfortable shooting RAW in manual mode with a DSLR or high-end mirrorless camera. You’ll go home after the workshop with a solid grasp of night photography in a moonlit environment, and a good foundation in light painting techniques. Topics covered will include scouting and planning, composing and focusing in low light, optimizing exposure for RAW capture and development with Lightroom, and light painting. Those with more experience are welcome, and we will offer guidance in the field if you mainly want to concentrate on creating portfolio images or more advanced techniques. The workshop is limited to 14 participants. Our locations are vast, so everyone will be able to spread out and not get in one another’s way. Each participant will have the opportunity to work one-on-one with Tim and Lance in the field. The Alabama Hills are a range of hills and rock formations near the eastern slope of the Sierra Nevada Mountains in the Owens Valley, west of Lone Pine in California. Television and movie productions—especially Westerns—have been filmed here since the 1920s. 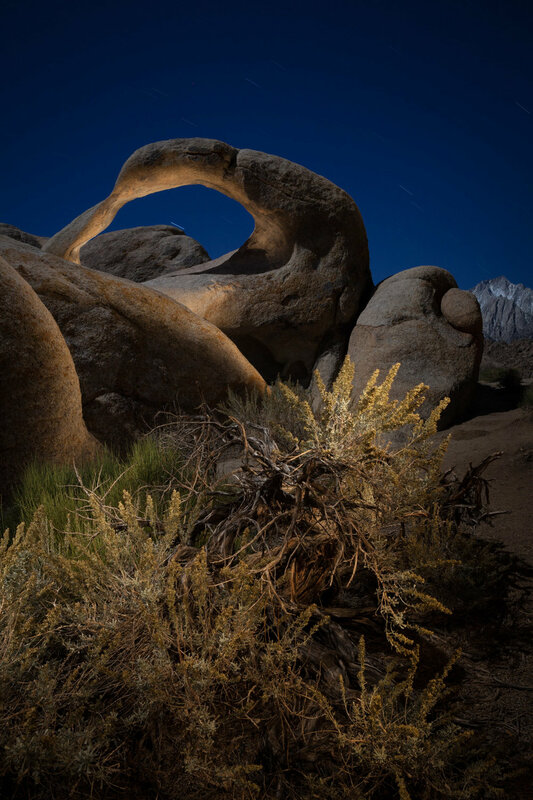 Dozens of natural arches are among the main attractions at the Alabama Hills, and these will be the focus of our workshop. The best known is Mobius Arch, and others include Lathe Arch, Lady Boot Arch and Cyclops Arch. 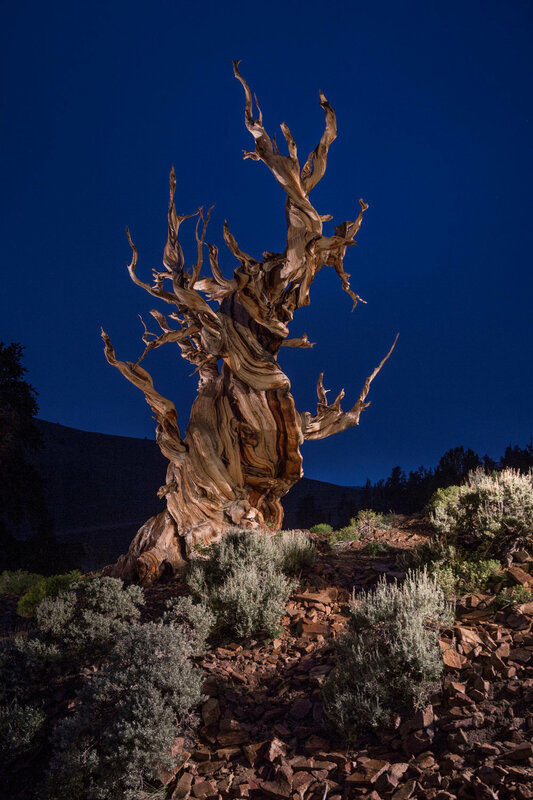 The Ancient Bristlecone Pine Forest, high in the White Mountains, is home to the oldest living things on earth. The most ancient of these noble trees are over 5,000 years old. The Great Basin Bristlecone Pine (Pinus longaeva) trees grow between 9,800 and 11,000 feet above sea level, and are protected within the Inyo National Forest in the sparse environment of the White Mountains, east of the Owens Valley. On the last night, we will photograph at a special mystery location that will be a pleasant surprise for everyone. The workshop is limited to 14 participants. The Eastern Sierra is isolated, but well worth the effort to get there. If you are interested in carpooling or sharing a rental car, let us know and we will try to connect you with another student looking for the same. You are responsible for arranging and paying for your own transportation. Lance's tip: Take an extra day and stop along the way—there is so much to see and photograph. You'll have less traffic leaving Las Vegas than L.A., and you'll go through Death Valley, but you'll have to cross over 9,000-foot mountains. Workshop accommodations for the first four nights are at the historic Dow Villa Motel in Lone Pine, Calif., where John Wayne stayed while in town for filming. You should book your room at the Dow Villa for arrival on October 29 and check-out on November 2. For the last two nights, we’ll be staying at the Holiday Inn Express in Bishop, CA., which is the largest town in the Eastern Sierra. You'll need to book a room in Bishop for the nights of November 2 and 3. You might consider staying over on the 4th unless you will be taking a very late flight, or are driving home. Bishop has a good variety of restaurants, an excellent coffee roaster, and is also home to Galen Rowell’s Mountain Light Gallery. We encourage eating two meals per day—a good breakfast and a great late lunch. When on the night shoots, you may wish to bring snack food or a sandwich and PLENTY OF WATER. You are responsible for arranging and paying for your own meals and accommodations. Be aware that the Bristlecone Pine Forest is located at 10,000 feet of elevation. If you are susceptible to altitude sickness, this should be considered before registering. It will also be cold up there—please consider your physical abilities prior to registering. If you have questions, please contact us—we're happy to talk it over with you. If the roads are closed due to snow, we will visit a different location. Be advised that we will be changing hotels and meeting space midway through the workshop. You'll need to book accommodations at both hotels. My mentor Steve Harper first introduced me to the Eastern Sierra during two summer classes in 1990. During the day, we had a figure photography class, and of course, we did full-moon night photography after dark. As it happened, it was to be Steve's last year teaching at The Academy of Art College in San Francisco, so I was lucky to have the experience. I'd been in California for only a year, and coming from the east coast, I'd never seen anything like the high desert of the Eastern Sierra. It was exhilarating—the grandeur of Tuolumne Meadows and Tioga Pass at the high elevations of Yosemite, and the crazy alien landscapes of Mono Lake. I was hooked. Some years later, when I was about to move to Massachusetts, the last place in California that I wanted to visit was Mono Lake and I dragged my then-eight-months pregnant wife up the 10,000 feet over Tioga Pass. I guess pregnancy exacerbates altitude sickness! A few years later, that high desert at the base of the Sierra was calling me, and I offered my first workshop to Mono Lake in 2003. It's the only location where I have taught every year continuously since that time. I can't get enough, and neither can my students, as it fills up every year. I'm excited to teach in the Eastern Sierra with my NPAN partner Tim Cooper in fall 2017, and I hope you'll join us. The above is subject to weather and other unpredictable events.